Harvey Lavan Cliburn, Jr., known to the world as “Van,” was the pianist from Texas who at age 23 astounded the world when he won the first Tchaikovsky International Piano Competition in Moscow in 1958, at the height of the Cold War. The Soviet Union, fresh from launching the satellite Sputnik into orbit the previous year and thereby gaining an edge on the Americans in worldwide technological competition, looked at the Tchaikovsky Competition as opportunity to showcase its cultural superiority over the United States. 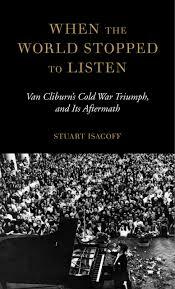 Stuart Isacoff’s When the World Stopped to Listen: Van Cliburn’s Cold War Triumph and Its Aftermath takes us behind the scenes of the 1958 competition to show the machinations that led to Cliburn’s selection in Moscow. They are intriguing, but come down to this: the young Cliburn was so impossibly talented, so far above his fellow competitors, that the competition’s jurors concluded that they had no choice but to award him the prize. But before the jurors announced what might have been considered a politically incorrect decision to give the award to an American, they felt compelled to present their dilemma to Soviet party leader and premier Nikita Khrushchev. Considered, unfairly perhaps, a country bumpkin lacking cultural sophistication, Khrushchev asked who had been the best performer. The answer was Cliburn. According to the official Soviet version, Khrushchev responded with a simple, straightforward directive: “Then give him the prize” (p.156). Isacoff, a professional pianist as well as an accomplished writer, suggests that there was more to Khrushchev’s directive than what the official version allows. But his response and the official announcement two days later, on April 14, 1958, that Cliburn had won first place make an endearing high point to Isacoff’s spirited biography. The competition in Moscow and its immediate aftermath form the book’s core, about 60%. Here, Isacoff shows how Cliburn became a personality known worldwide — “the classical Elvis” and “the American Sputnik” were just two of the monikers given to him – and how his victory contributed appreciably to a thaw in Cold War tensions between the United States and the Soviet Union. The remaining 40% of the book is split roughly evenly between Cliburn’s life prior to the Moscow competition, as a child prodigy growing up in Texas and his ascendant entry into the world of competitive piano playing; and his post-Moscow life, fairly described as descendant. Cliburn never recaptured the glory of his 1958 moment in Moscow, and his life after receiving the Moscow prize was a slow but steady decline, up to his death from bone cancer in 2013. For the lanky, enigmatic Texan, Isacoff writes, “triumph and decline were inextricably joined” (p.8). Cliburn was born in 1934, in Shreveport, Louisiana, the only child of Harvey Lavan Cliburn, Sr., and Rildia Bee O’Bryan Cliburn. When he was six, he moved with his parents from Shreveport to the East Texas town of Kilgore. Despite spending his earliest years in Louisiana, Cliburn always considered himself a Texan, with Kilgore his hometown. Cliburn’s father worked for Magnolia Oil Company, which had relocated him from Shreveport to Kilgore, a rough-and-tumble oil “company town.” We learn little about the senior Cliburn in this biography, but mother Rildia Bee is everywhere. She was a dominating presence upon her son not only in his youthful years but also throughout his adult life, up to her death in 1994 at age 97. Prior to her marriage, Rildia had been a pupil of renowned pianist Arthur Friedheim. It was Southern mores, Isacoff suggests, that discouraged her from pursuing what looked like her own promising career as a pianist. But with the arrival of her son, she found a new outlet for her seemingly limitless musical energies. Rildia was “more teacher than nurturer” (p.12), Isacoff writes, bringing discipline and structure to her son, who had started playing the piano around age 3. From the start, the “sonority of the piano was entwined with his feelings for his mother” (p.12). By age 12, Cliburn had won a statewide piano contest, and had played with the Houston Symphony Orchestra in a radio concert. In adolescence, with his father fading in importance, Cliburn’s mother continued to dominate his life. “Despite small signs of teenage waywardness, when it came to his mother, Van was forever smitten” (p.21). In 1951, at age 17, Rildia and Harvey Sr., sent their son off to New York to study at the prestigious Juilliard School, a training ground for future leaders in music and dance. There, he became a student of the other woman in his life, Ukraine-born Rosina Lhévinne, a gold-medal graduate of the Moscow Conservatory whose late husband Josef had been considered one of the world’s greatest pianists. Like Rildia, Lhévinne too was a force of nature, a powerful influence on the young Cliburn. Improbably, Lhévinne and Rildia for the most part saw eye to eye on the best way to nurture the talents of the prodigious young man. Both women focused Cliburn on “technical finesse and beauty of sound rather than on musical structure,” realizing that his best qualities as a pianist “rested on surface polish and emotional persuasiveness” (p.54). Each recognized that for Cliburn, music would always be “visceral, not abstract or academic. He played the way he did because he felt it in the core of his being” (p.34). More than Rildia, Lhévinne was able to show Cliburn how to moderate and channel these innate qualities. Without her stringent guidance, Isacoff indicates, Cliburn might have lapsed into “sentimentality, deteriorating into the pianistic mannerisms of a high romantic” (p.56). Although learning through Lhévinne to hold his interpretative flourishes in check, Cliburn’s “overriding personality – emotionally exuberant, and unshakably sentimental – was still present in every bar” (p.121). By the time he left for the Moscow competition, Cliburn had demonstrated a “natural ability to grasp and convey the meaning of the music, to animate the virtual world that arises through the art’s subtle symbolic gestures. It set him apart” (p.18). During his Julliard years in New York, the adult Cliburn personality the world would soon know came into view: courteous and generous, sentimental and emotional. He had by then also developed the idiosyncratic habit of being late for just about everything, a habit that continued throughout his life. Isacoff mentions one concert after another in which Cliburn was late by periods that often became a matter of hours. Both in the United States and abroad, he regularly compensated for showing up late by beginning with America’s national anthem, “The Star Spangled Banner.” At Juilliard, Cliburn also began a smoking habit that stayed with him for the remainder of his life. Except when he was actually playing — when he had the habit of looking upward, “as if communing with the heavens whenever the music reached an emotional peak” (p.6) — it was difficult to get a photo of him without a cigarette in his hands or mouth. It may have been at Juilliard that Clliburn had his first homosexual relationship, although Isacoff plays down this aspect of Cliburn’s early life. He mentions Cliburn’s experience in high school dating a girl and attending the senior prom. Then, a few pages later, he notes matter-of-factly that a friendship with a fellow male Juilliard student had “blossomed into romance” (p.35). But there are many questions about Cliburn’s sexuality that seem pertinent to our understanding of the man. Did Cliburn undergo any of the torment that often accompanies the realization in adolescence that one is gay, especially in the 1950s? Did he “come out” to his friends and acquaintances, in Texas or New York, or did he live the homosexual life largely in the closest? Were his parents aware of his sexual identity and if so, what was their reaction? None of these is treated here. With little fanfare, Juilliard nominated Cliburn in early 1958 for the initial Tchaikovsky International Competition, taking advantage of an offer of the Rockefeller Foundation to pay travel expenses for one entrant in each of the competition’s two components, piano and violin. The Soviet Union, which paid the remaining expenses for the participants, envisioned a “high-culture version of the World Cup, pitting musical talents from around the globe against one another” (p.4). The Soviets confidently assumed that showcasing its violin and piano expertise after its technological success the previous year with the Sputnik launch would provide another propaganda victory over the United States. Soviet pianists who wished to enter the competition had to pass a daunting series of tests, musical and political, to qualify for the competition, with training similar to that of its Olympic athletes. Many of the Soviet Union’s emerging piano stars were reluctant to jump into the fray. Each had a specific reason, along with a “general reluctance to become involved in the political machinations of the event” (p.59). Lev Vlassenko, a “solid, well-respected pianist” who became a lifetime friend of Cliburn in the aftermath of the competition, emerged as the presumptive favorite, “clearly destined to win” (p.60). On the American side, the US State Department only reluctantly gave its approval to the competition, fearing that it would be rigged. The two pianists whom the Soviets considered the most talented Americans, Jerome Lowenthal and Daniel Pollack, traveled to Moscow at their own expense, unlike Cliburn (pop singer Neil Sedaka was among the competitors for the US but was barred by the Soviets as too closely associated with decadent rock ‘n roll; they undoubtedly did Sedaka a favor, as his more lucrative pop career was just then beginning to take off). Other major competitors came from France, Iceland, Bulgaria, and China. For the competition’s first round, Cliburn was assigned pieces from Bach, Mozart, Chopin, Scriabin, Rachmaninoff, Liszt and Tchaikovsky. The audience at the renowned Moscow Conservatory, where the competition took place, fell from the beginning for the Texan and his luxurious sound. They “swooned at the crooner in him . . . Some said they discerned in his playing a ‘Russian soul’” (p.121). But among the jurors, who carried both political and aesthetic responsibilities, reaction to Cliburn’s first round was mixed. Some were underwhelmed with his renditions of Mozart and Bach, but all found his Tchaikovsky and Rachmaninoff “out of this world,” as one juror put it (p.120). Isacoff likens the jurors’ deliberations to a round of speed dating, “where the sensitive antennae of the panelists hone in on the character traits of each candidate. . . There is no magical formula for choosing a winner; in the end, the decision is usually distilled down to a basic overriding question: Do I want to hear this performer again?”(p.117). Famed pianist Sviatoslav Richter, who served on the jury, emerges here as the equivalent of the “hold out juror” in an American criminal trial, “willing to create a serious ruckus when he felt that the deck was being stacked against the American. As the competition progressed, his fireworks in the jury room would be every bit the equal of the ones onstage” (p.114). Cliburn’s second round program was designed to show range. Beethoven, Chopin and Brahms were the heart of a romantic repertoire. He also played the Prokofiev Sixth, a modernist piece that reflected the political tensions and fears of 1940 Russia. Cliburn received a 15-minute standing ovation at the end of the round, the audience voting literally with its feet and hands. In the jury room, Richter continued to press the case for Cliburn, although the jury ranked him only third, tied with Soviet pianist Naum Shtarkman. Overall, Vlassenko ranked first and eminent Chinese pianist Shikun Liu second. After Van, people would never again hear this music the same way. . . There is no simple explanation for why in that moment Van played perhaps the best concert of his life. Sometimes a performer experiences an instant of artistic grace, when heaven seems to open up and hold him in the palm of its hand – when the swirl of worldly sensations gives way to a pervasive, knowing stillness, and he feels connected to life’s unbroken dance. If that was not exactly Van’s experience when playing Rachmaninoff Concerto no. 3, it must have come close (p.146-47). Cliburn had finally won over even the most recalcitrant jurors, who briefly considered a compromise in which Cliburn and Vlassenko would share the top prize. But the final determination was left to premier Khrushchev. The Soviet leader’s instantaneous and decisively simple response quoted above was the version released to the press. But with the violin component of the competition going overwhelmingly to the Soviets, the ever-shrewd Khrushchev appears to have concluded that awarding the piano prize to the American would underscore the competition’s objectivity and fairness. One advisor recalled Khrushchev saying to her: “The future success of this competition lies in one thing: the justice that the jury gives” (p.156). The jury’s official and public decision of April 14, 1958 had Cliburn in first place, with Vlassenko and Liu sharing second. Cliburn could not have accomplished what he did, Isacoff writes, without Khrushchev, his “willing partner in the Kremlin” (p.206). Cliburn had another willing partner in Max Frankel, then the Moscow correspondent for the New York Times (and later, its Executive Editor). Frankel had sensed a good story during the competition and reported extensively on all its aspects. He also pushed his editors back home to put his dispatches on page 1. One of his stories forthrightly raised the question whether the Soviets would have the courage to award the prize to Cliburn. For Isacoff, Frankel’s reporting and the pressure he exerted on his Times editors to give it a prominent place also contributed to the final decision. After his victory in Moscow, Cliburn went on an extensive tour within the Soviet Union. To the adoring Russians, Cliburn represented the “new face of freedom.” Performing under the auspices of a repressive regime, he “seemed to answer to no authority other than the shifting tides of his own soul” (p.8). Naïve and politically unsophisticated, Cliburn raised concerns at the State Department when he developed the habit of describing the Russians as “my people,” comparing them to Texans and telling them that he had never felt so at home anywhere else. 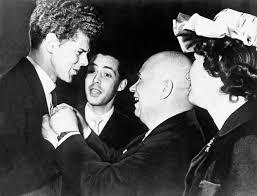 A month after the Moscow victory, Cliburn returned triumphantly to the United States amidst a frenzy that approached what he had generated in the Soviet Union. He became the first (and, as of now, only) classical musician to be accorded a ticker tape parade in New York City, in no small measure because of lobbying by the New York Times, which saw the parade as vindication for its extensive coverage of the competition. After Cliburn’s Moscow award, the Soviet Union and the United States agreed to host each other’s major exhibitions in the summer of 1959. It started to seem, Isacoff writes, that “after years of protracted wrangling, a period of true detente might actually be dawning” (p.174). The cultural attaché at the American Embassy in Moscow wrote that Cliburn had become a “symbol of the unifying friendship that overcomes old rivalries. . . a symbol of art and humanity overruling political pragmatics” (p.206). A genuine if improbable bond of affection had developed in Moscow between Khrushchev and Cliburn. That bond endured after Cold War relations took several turns for the worse, first after the Soviets shot down the American U-2 spy plane in 1960, followed by erection of the Berlin Wall in 1961, and the direct confrontation in 1962 over Soviet placement of missiles in Cuba. The bond even continued after Khrushchev’s fall from power in 1964, indicating that it had some basis beyond political expediency. But Cliburn’s post-Moscow career failed to recapture the magic of his spring 1958 moment. The post-Moscow Cliburn seemed to be beleaguered by self-doubt and burdened by psychological tribulations that are not fully explained here. “Everyone had expected Van’s earlier, youthful qualities to mature and deepen over time,” Isacoff writes. But he “never seemed to grow into the old master they had hoped for . . . At home, critics increasingly accused Van of staleness, and concluded he was chasing after momentary success with too little interest in artistic growth” (p.223). Even in the Soviet Union, where he made several return visits, critics “began to complain of an artistic decline” (p.222). In these years, Cliburn “developed an enduring fascination with psychic phenomena and astrology that eventually grew into an obsession. The world of stargazing became a vital part of his life” (p.53). Cliburn’s mother remained a dominant force in his life throughout his post-Moscow years, serving as his manager until she was almost 80 years old. As she edged toward 90, she and her son continued to address one another as “Little Precious” and “Little Darling” (p.230). Her death at age 97 in 1994 was predictably devastating for Cliburn. In musing about his mother’s effect on Cliburn’s career trajectory, Isacoff wonders whether Rildia Bee, the “wind that filled his sails” might also have been the “albatross that sunk him” (p.243). While many thought that Cliburn might collapse with the death of his mother, by this time he was in a relationship with Tommy Smith, a music student 29 years younger. With Smith, Cliburn had “at last found a fulfilling, loving union” (p.242). Smith traveled regularly with Cliburn, even accompanying him to Moscow in 2004, where none other than Vladimir Putin presented Cliburn with a friendship award. Smith was at Cliburn’s side throughout his battle with bone cancer, which took the pianist’s life in 2013 at age 79. Tommy Smith became the happy ending to Cliburn’s uneven life story — a story which for Isacoff resembles that of a tragic Greek hero who “rose to mythical heights in an extraordinary victory that proved only fleeting, before the gods of fortune exacted their price” (p.8). Tom, thanks for the information about Cliburn. I was previously unaware of this history. I like the idea of cultural exchange with national adversaries. I abhor the idea of art as competition. Music should be about creativity, soul, and appreciation. Nevertheless, I’m glad to learn about Cliburn’s interesting life. He had a strange relationship with his mother. It seems that Cliburn reached sublime transcendence while performing. Perhaps his career would have been more satisfying if his mother hadn’t pushed him to be competitive.